A video showing members of the Parachute Regiment shooting paint rounds at a picture of Labour leader Jeremy Corbyn at a range in Kabul emerged this week, with news outlets quick to investigate and cover the story. We have 400 soldiers from the brigade conducting force protection in Afghanistan and working closely with both NATO and Afghan partners. These soldiers are doing an outstanding job in theatre but this serious error of judgment is being fully investigated by the Army. Today most papers cover reaction to the social media video. The Times reports that the Defence Secretary had praised the "prompt and clear" leadership shown by the Army in responding to the video. Brig Perry said in a statement: "Let me be clear - the Army is, and always will be, an apolitical organisation." Yesterday two Russian Blackjack Tupolev Tu-160 long-range bombers approached the north-east coast of the UK in international airspace. Typhoon aircraft from RAF Lossiemouth scrambled to monitor the aircraft and ensure they weren't able to approach UK airspace. An RAF Voyager from RAF Brize Norton supported the Typhoons. Several newspapers including The Telegraph, The Sun, the Daily Mirror and the Scotsman have reported the operation. In a longer piece, The Herald reports that there has been a steady increase in the number of Russian approaches to UK airspace in 2019. The BBC News website reports that this is the second time RAF Typhoons have monitored Russian aircraft around the UK in just five days. Sky News reported that RAF Typhoons intercepted two Russian Blackjacks in an incident last Friday. The RAF was not required to intercept the aircraft involved in yesterday's incident. "Our Armed Forces are trained and deployed around the world to ensure they are ready to keep the UK safe from any potential threat. Yet again, the RAF have proven that they can respond at speed to Russian activity over the North Sea." 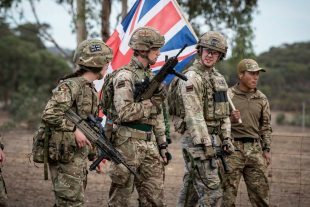 British soldiers have taken part in the Australian Army Skills at Arms meeting in Puckapunyal, Victoria.